We are all familiar with the classic bay tree lollipop shape standard, but how about a completely different colour option? 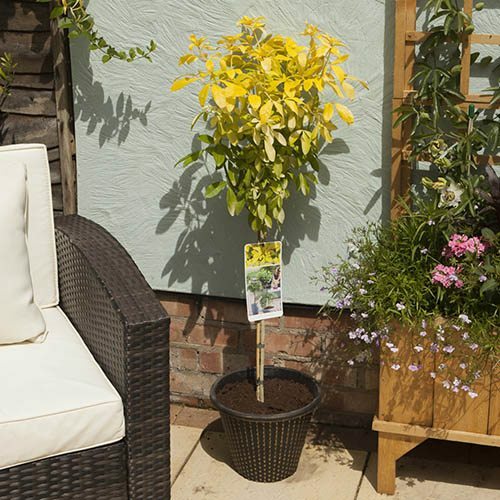 The fabulous golden yellow leaves of Choisya 'Sundance' (or Mexican Orange Blossom as it is sometimes called due to their small white fragrant flowers in spring), glow bright golden yellow in spring and summer, yet remain neat and tidy too. And they are ever-yellow too - they remain bright yellow all year, even in winter, so offer a real year round feature. Grown on a clear stem of about 50cm, these standard Choisya’s are quite unusual, and work really well as a low maintenance feature in pairs either side of a doorway or gate. Supplied in a 3L pot, a standard lollipop form tree, with a clear 50cm stem, and trimmed head, 90-10cm tall inc pot.